A quick wander around the water cooler – or Sevens box – of Tanner De Witt reveals a staff that would not bat an eye lid at this notion. In fact, they’d simply smile and ask “How so?”. They have a veritable league of nations in their hires, from Italian, French, Nepalese, Canadian, local and mainland Chinese, Dutch, English, Kiwis and Aussies, as well as Hong Kong player Rowan Varty (who is a half Macanese and English). However, he’s not the only serious rugby player in the firm: partner Kim Boreham (who plays forward) represented Hong Kong in Kazakhstan the week after she joined the firm. She is also a director at the HKRU. Apart from such diversity, many years ago TDW partners decided the bottom line wasn’t the only thing that mattered, being part of the entire community did. This is taking diversity to the Nth degree; juxtaposing elegant and well-groomed women dining at a five-star hotel to the other end of the spectrum with the Fat Boy Tens. 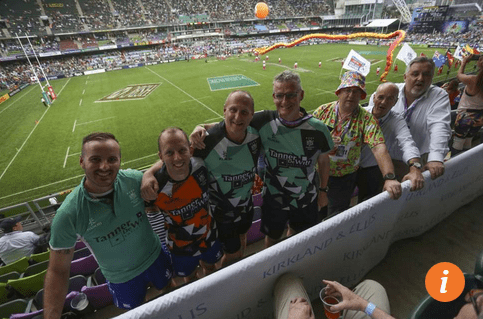 (From left to right) refs, lawyers and corporates Tim Baker, Matt Roddeu, Hugh Watkins, Tobi Lothian with Robin Darton, Eddie Middleton and Ian De Witt all together at the 2017 Hong Kong Sevens. See full article from Robby Nimmo here. Copyright © 2019 Tanner De Witt. Unless you are an existing client, before communicating with Tanner De Witt by e-mail (or otherwise), please read the Disclaimer referenced by this link. (The Disclaimer is also accessible from the opening of this website). As noted therein, until you have received from us a written statement that we represent you in a particular manner (an “engagement letter”) you should not send to us any confidential information about any such matter. After we have undertaken representation of you concerning a matter, you will be our client, and we may thereafter exchange confidential information freely. Thank you for your interest in Tanner De Witt.